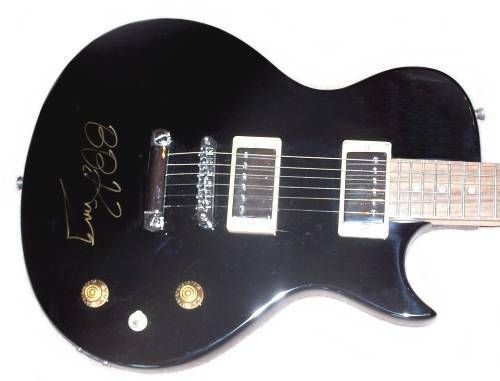 A black electric guitar signed by blues legend B.B. King. Comes with a Certificate of Authenticity. B.B. 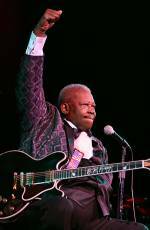 King, is an American songwriter, vocalist, and famed blues guitarist. Rolling Stone magazine ranked him at No. 6 on its list of the 100 greatest guitarists of all time, and he was ranked No. 17 in Gibson's Top 50 Guitarists of All Time. According to Edward M. Komara, King "introduced a sophisticated style of soloing based on fluid string bending and shimmering vibrato that would influence virtually every electric blues guitarist that followed." King was inducted into the Rock and Roll Hall of Fame in 1987. He is widely considered one of the most influential blues musicians of all time, because of this he is often nicknamed 'The King of Blues'. ~ Wikipedia.